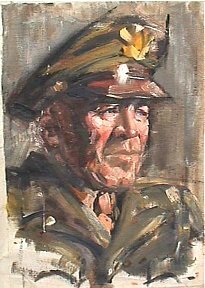 An event that Danton and I had planned for many months was a visit to a storage vault that was filled to the max with paintings, documents, and other items that had belonged to John Coleman Burroughs. This storage area had been sealed since his father's death back in the late '70s and we were very excited about recovering the treasures it held. Knowing that this vault housed a Burroughs collection we knew we would not be disappointed. Danton and I drove partway down his long winding lane to the corral area where he stores his trailer. The "corral" is a flat area downslope from the main house and is surrounded by lush California vegetation, storage sheds and fencing. 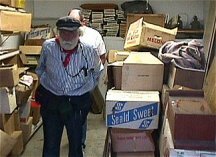 The horse stables still remain on one side of the area, but they and the corral are now used to house large collectibles that Dan has amassed over the years, as well as items rescued from the Tarzana Ranch property. The other function of this property is to provide overflow parking for family and guests. Imposing lion statures guard a winding stone staircase that leads up through the Tarzana jungle to the side entrance of the house. 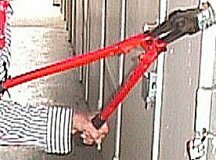 After rolling back the main barricade, the welcoming smile of the keeper of the vaults turned to a look of surprise and suspicion when Danton approached the JCB vault brandishing a huge bolt cutter. The key to the crypt had been long lost and the only way to gain entry was by forceful means! The heavy metal door finally yielded and the treasures within were revealed albeit through a heavy coat of dust. The first thing we saw was Ed's favourite chair, followed by a large projector that probably had been used in the regular showing of the current Hollywood releases in the Tarzana Ranch ballroom. 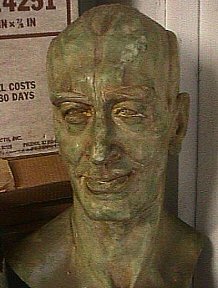 We were all startled when we saw Ed's countenance peering down on us from atop a storage locker -- it was the original bust of ERB from which numerous molds had been made. After this first series of shocks we were ready to get down to work. Danton donned a dust mask, John and I readied our cameras, and we all started what would be an afternoon-long task of dragging items out to the light, identifying, and then transferring them to the tailgate of the trailer where I snapped close-up shots with my digital camera before packing them for transport back to a secure storage area at Tarzana Ranch. We soon realized just how prolific and diverse were the talents of this man: framed oil paintings, carvings, photos and negatives of models used in his art works, the original Danton Doring collection, original art for the John Carter Sunday pages, scores of storyboards and set design charcoals for Warner Brothers and Universal Pictures, manuscripts, articles and clippings, original sketches and art for the Douglas Aircraft WWII propaganda / training booklets . 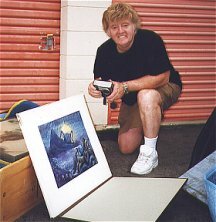 . . thousands of pieces of original art... unbounded imagination.... and all collated, referenced, and in near-mint condition. JCB's longtime caregiver and admirer, Nanette Mark, had encouraged us for years to try to discover what remained of his work -- especially the boxfulls of colour transparencies on which he had so meticulously organized and preserved his work. We were all thrilled at the extent of this mother lode. Finally, threat of rain sped up our work. 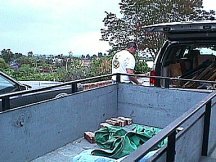 We finished loading, covered the booty with tarps and sped through Tarzana to a secure, climatically controlled area where the goods could be catalogued at leisure. We were slated to meet Helen Baker and the Tarzana Community and Cultural Center volunteers, Peter and Steve, at Charlie G's for dinner at seven. 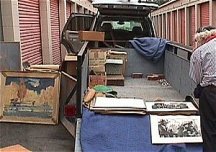 By the time we had unloaded and returned the trailer to the corral we were hopelessly late. Eventually we all gathered at the bar, the treasure hunters still heady from the euphoria of the day's events. Thanks to the unflagging energies of Helen and her volunteers the Tarzana Centre is starting to take shape. They have obtained a major piece of property and building at the corner of VanAlden and Ventura and are in the process of researching Tarzana history, planning workshops, assembling ERB memorabilia, designing a Web site and newsletters, landscaping the area, and brainstorming a million and one things that would benefit the Tarzana community. And as our late night dinner turned into such a brainstorming session. I was delighted to discover that they already know as much about my Tarzana Web page features as do I. We dined, drank, chatted, planned and took group photos long past Charlie G's closing time. We even went out front to Ventura Boulevard where we took photos of the bronze ERB plaque that is imbedded in the sidewalk. One old Tarzana photo that Peter had framed and presented to Danton was particularly interesting. Back in 1971 during our first "pilgrimage" to Tarzana, Sue-On and I had stayed at a motel just down the street from ERB, Inc. During our visit to ERB, Inc. Hulbert Burroughs had given us a tour of the offices and warehouse. 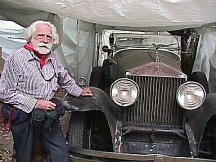 Then, when I mentioned I had a rare run of 77 1932 Tarzan radio shows starring Jim and Joan Burroughs Pierce, he invited us to come back the next day to meet the Pierces as they had not heard the shows since the '30s (read the whole story with photos in ERBzin-es No. 192 and No. 193 ). Not wanting to miss this opportunity we changed our travel plans and checked into the nearby Avalon Motel. The facility was pretty much on its last legs but it was close... and the room rates were in line with the budgets of broke university students. On future visits we couldn't locate the motel and had often wondered if there really had been such a place or if it had been a figment of our imaginations. Seeing the framed Avalon photo brought back many memories.